This book is dedicated solely to ensuring a happier, healthier future for today's children. Includes a total program of diet & exercise customized for every age & fitness level. - Publisher Begin now to ensure a happier, healthier future for your children! Smart eating, exercise, and total family involvement are the cornerstones of this lifestyle program. Customized by age (preschoolers to teenagers) and fitness level (unfit to athletic), it dramatically increases overall fitness, mental alertness, and self-esteem. It's a fun-filled phys. ed. class for your home! - Publisher From Dr. Kenneth Cooper-a world-renowned leader in aerobics, preventive medicine, and fitness-comes the first book dedicated solely to ensuring a happier, healthier future for today's children. Begin now to ensure a happier, healthier future for your children! Smart eating, exercise, and total family involvement are the cornerstones of this lifestyle program. Customized by age (preschoolers to teenagers) and fitness level (unfit to athletic), it dramatically increases overall fitness, mental alertness, and self-esteem. It's a fun-filled phys. ed. class for your home! 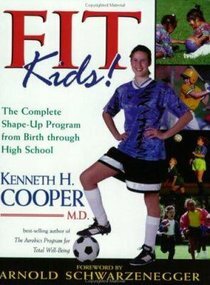 From Dr. Kenneth Cooper-a world-renowned leader in aerobics, preventive medicine, and fitness-comes the first book dedicated solely to ensuring a happier, healthier future for today's children.